Hey Campers, here is the information for Summer Camp this year for Pack 148, Cub World! Camp this summer will be at Camp Phillips in Rice Lake, WI. Camp Phillips is part of the Chippewa Valley Council. 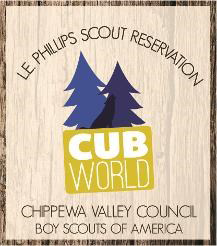 The name of the camp program is Cub World, and the Pack will be going Friday July 10 through Sunday July 12. We will depart around 2:30 Friday afternoon. Check-in: Friday, 2 - 5:30 P.M.
We will be sleeping in one of 3 inside building areas, or if you want you can reserve a tent. Please sign up as soon as possible with me via email or phone or at the upcoming Pack meeting. I will have a presentation and signup at the upcoming Pack meeting. We need to make payment by May 1 but if there are people on the fence we will be able to add them later on as long as there is open space at the camp. Camping in the outdoors at Cub World is often a highlight of a young boy's Scouting experience. At camp, Cubs can grow and learn many things about the world around them. They can experience a variety of activities, work on their individual rank achievements and arrow points. Cubs and adults will sleep in the comfort of Fort Rice, Indian Lodges (tipis), or if desired, tents. Campers sleep on the bunkbeds with firm mattresses. All sleeping areas in the fort are enclosed and screened for your comfort. The fort contains male and female showers and toilet facilities. Meals are served buffet style in the large dining area of the fort. If your pack is looking for that unusual experience, then look no further than the Tipi Village! Three large tipis are available for Cubs and Webelos to enjoy a taste of Native American living. The tipis hold a total of 20 people and are set up on their own campsite overlooking Bass Lake. The site is equipped with water and a latrine. The village is approximately 300 yards from Fort Rice. The tipis are set off the ground on large platforms. Cots are provided for sleeping. For those packs looking for a more traditional camping experience, tents are available upon request, on a first-come first-served basis. Each tent sleeps 4 people, mattresses are provided for sleeping. These nylon tents with floors, are set up in a small field next to Fort Rice. The camp also offers T-Shirts customized with our Pack Number for $10. We will pick them up upon arrival at camp. Please fill out the attached health forms and return to me (they are different than the Polar Camp ones so you will need to fill these out). Financial help is available for Scouts who would not otherwise be able to attend camp. Applications need to be approved by the unit leader and submitted to the Scout Service Center as soon as possible, no later than May 1. Financial Assistance applications are also available at the Scout Service Center. Scouts receiving camperships are not eligible for the Gold Card discount. Give me a ring anytime with questions, 715-441-1239. Where do donations go? Visit the Northern Star Council Friends Of Scouts for details. Our FOS campaign runs from November to May. Thank you to all who volunteered and donated! Contributions may be made via cash, personal check, or credit card. Like Us, Pack 148 on Facebook! OUTDOOR ADVENTURE ALL Year Long!